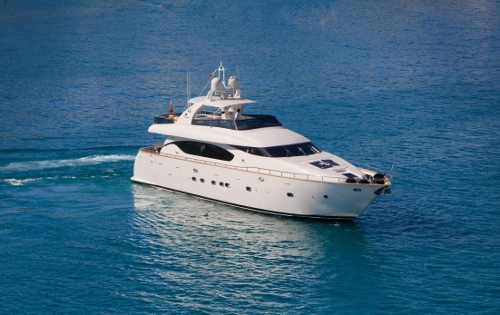 Motor yacht MEME - Main. 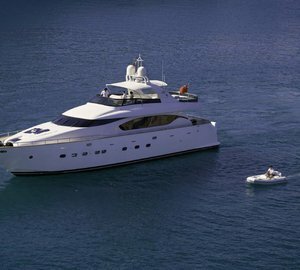 Luxury motor yacht MEME was designed by Italian Naval architect FIPA Italiana yachts S.r.l and built by Maiora in 2006. 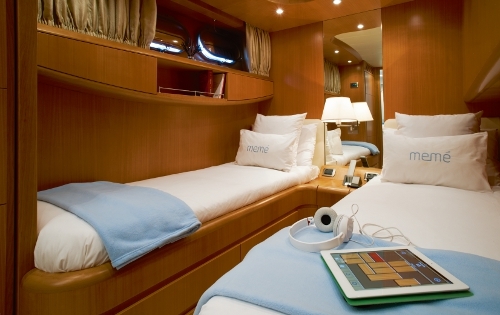 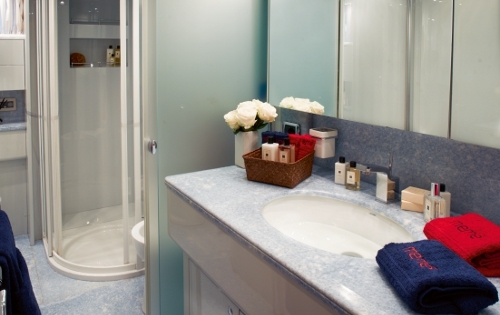 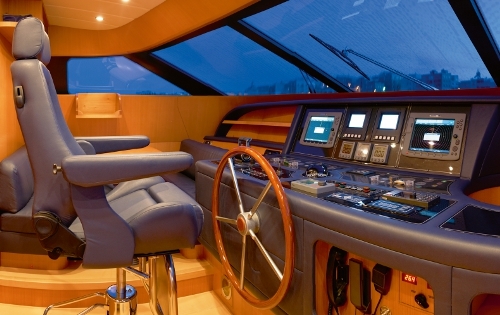 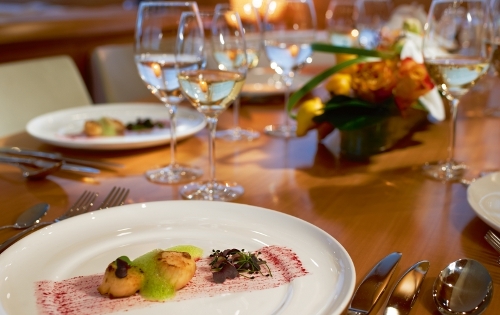 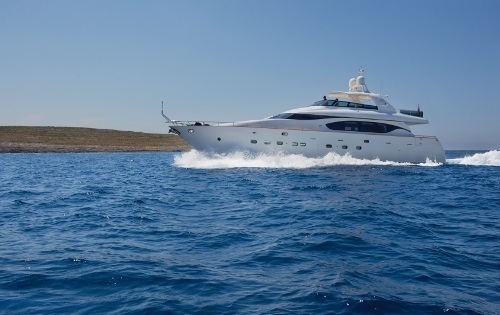 She measures 24 meters (78.8ft) and can accommodate up to 9 guests in 4 cabins. 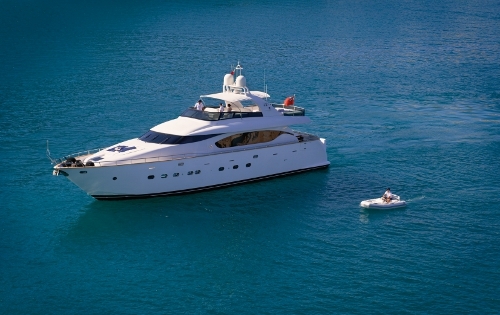 Yacht MEME is a semi displacement GRP hull, powered by two MTU 12V 2000 m93 C.R. 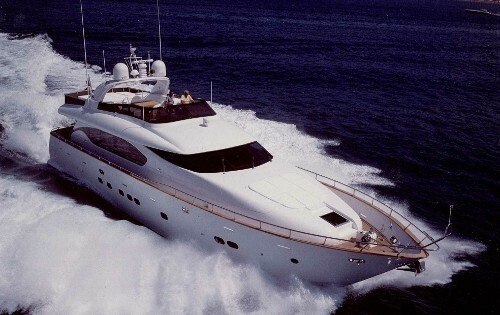 1340 kw engines and cruises at 17.5 knots with maximum speeds of 28 knots. 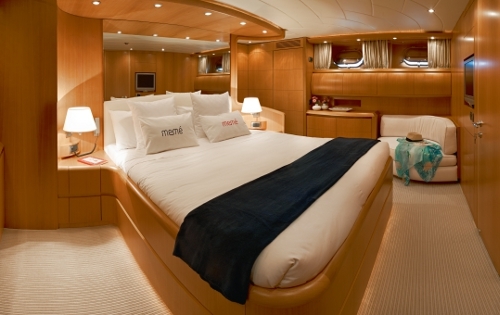 M/Y MEME has a minimalistic welcoming interior featuring light toned wood, cream soft furnishings and light neutral carpets throughout. 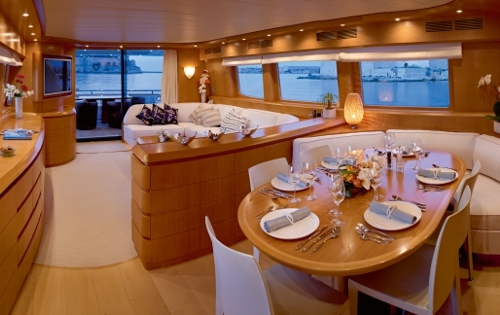 The salon and dining are an open plan with a low divider separating them, the salon is adjacent to the generous aft deck through sliding glass doors, a sofa and coffee table sit to port while an entertainment system is on the starboard, forward of the salon the formal dining space features an elegant oval table with additional seating, large windows allow the entire cabin area to receive plenty of natural light. 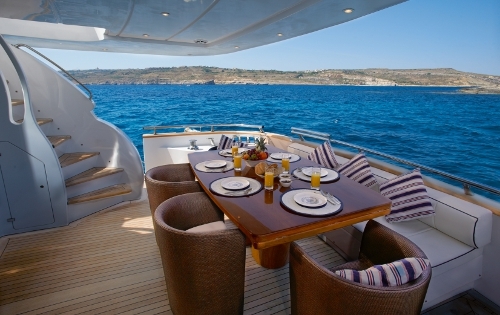 Charter yacht MEME offers guests ample places to relax and entertain, leading out from the main salon the aft deck is shaded with an alfresco dining option, a curving staircase on the starboard side continues up onto the flybridge where guests can enjoy large sunpads, an alfresco dining option and additional lounge seating, a removable Bimini is available. 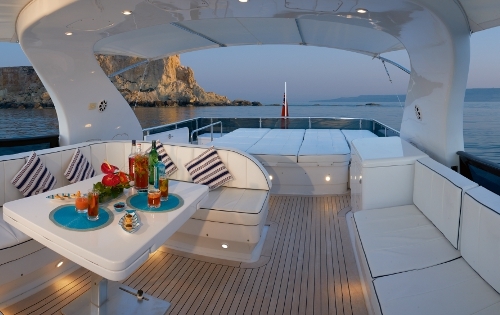 For a more intimate escape the foredeck offers a further double sunpad. 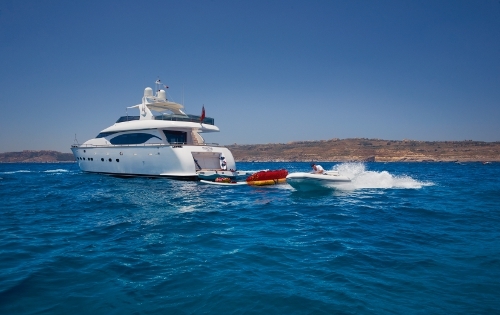 Motor yacht MEME boasts and good range of water toys for a yacht of her size, all easily accessed from the hydraulic lowering transom which creates a large extended swim platform. 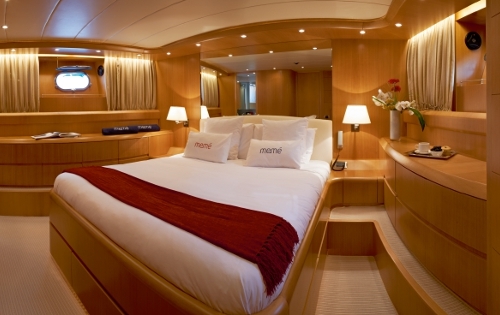 Luxury charter yacht MEME can accommodate up to 9 guests in 4 cabins; the master suite is full beam of the yacht with a walk around queen size bed, love seat and en-suite facilities, the VIP cabin is forward and full beam of the yacht with a walk around queen size bed and en-suite facilities, 2 twin en-suite cabins feature single beds, one with an additional Pullman berth, each cabin is light and airy, large mirrors create the illusion of further open spaces. 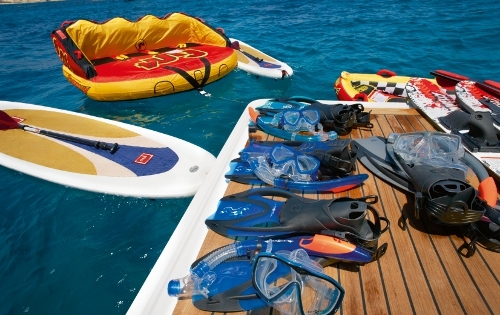 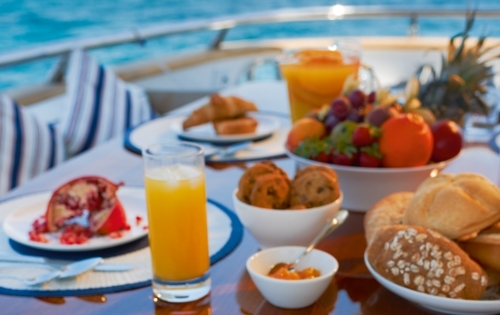 The MEME motor yacht has the following Tenders + toys: Wake board (children & adult), Water-ski (children, medium and advanced), 2 Paddel Boards, Towable toys, Inflatable kayak, 5 Tuna fish rods, Snorkeling equipment.